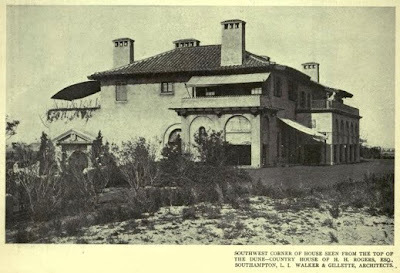 'Black Point', the Henry Huddleston Rogers estate designed by Walker & Gillette between 1914-16 in Southampton, with landscaping by the Olmsted Brothers. Rogers, son of H.H. Rogers, a founder and long time president of Standard Oil, inherited a large fortune including sole ownership of the Virginia Railway Company upon his father's death in 1909. He was also involved in a number of other transportation companies. Rogers was in the New York National Guard and served with the American Expeditionary Force in World War I, receiving numerous awards for service. While in the Guard, he moved up in rank from second lieutenant to captain and was made colonel in command of the First Field Artillery in 1913 after he graduated from the School of Fire, United States Army, located at Fort Sill, Oklahoma. He was a member of the New York Yacht Club and owned an electrically driven yacht named 'Fan-Kwai'. He died in 1935. Walker & Gillette won both the Architectural League and AIA's gold medal for Excellence in Residential Design for this commission. The house has since been demolished. Click HERE to see where 'Black Point' stood on google earth. 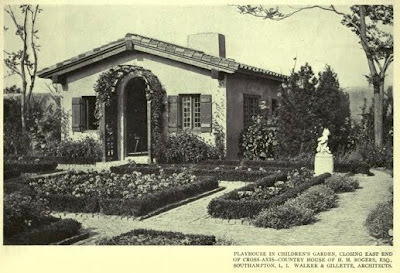 It looks quite a bit like the house and gardens built some years earlier by Alfred M. Hoyt. everywhere to what must have been extraordinary breezes. 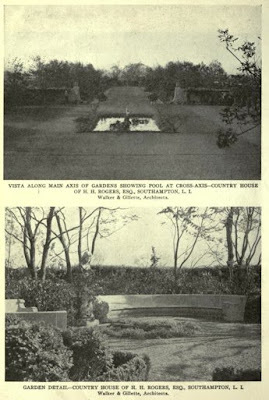 I think there are many great pictures in the Acanthus Press book "Houses of the Hamptons, 1880-1930" and Black Point is the cover. This was one of the most admired houses of its day, published everywhere....and indeed, there is nothing to criticize----superbly integrated landscaping, engaging elevations, and superb interiors, and a highly functional and efficient plan. When Walker and Gillette were good, they were very good. Funny that despite this, they've never gotten their own monograph in the flurry of archtitect revivals going on in the last decade. Incidentally, Ancient, a family friend's parents bought the Hoyt villa in the 30's, and he once contrasted growing up there with the Rogers house which he also knew well---said that the Hoyt house's interiors were huge, grand, cold and impersonal, that this one was on a more human scale with greater warmth and a certain sensuous quality. 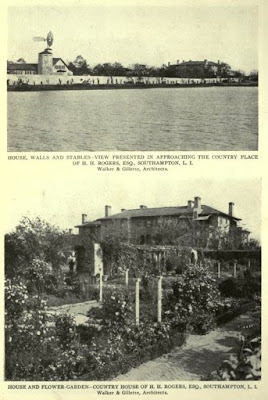 Very odd coincidence, the next two posts I have queued up for my own blog are about a very dull Italian villa of similar scale and not nearly as good architecture up here in our neck of the woods, and about the decorating exploits of the friend who grew up in the Hoyt villa. like i said before - all the interesting ones go and the plebian stay. this one is off the chart interesting. didn't have to go far for a dip and spectacular landscaping. must have crushed a thousand plover eggs every time they went out for a smoke. interesting the scale from different views. this one looks huge from the front but the west view doesn't look so imposing. another that loved the awnings. we even had them up here in the sticks in the 30's altho they looked REALLY out of place here. That's the one thing about these great old houses, they all had beautiful decorative awnings, to keep out the sun and heat. Some even had the owners initials on them. So many people think these big old houses look so cold and uncomfortable, but it was the awnings, flowers and potted plants, which you rarely see that softened up these homes! You will doubtless be delighted to hear that I am having dinner this evening with someone who is probably the last living person to have been there when the Hoyts still owned it. I don't think I can quite bring myself to use "cold" or "impersonal," but I will learn what I can. Beyond that, remember that the house was built for a very rich Victorian, who died before it was completed. 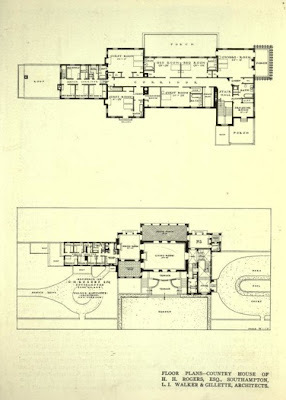 His widow and youngest daughter oversaw the completion of the house as they imagined he would have liked. Mrs Hoyt gave over the house to her daughter, who after a time, leased it to Marjorie Merriweather Post and one of her husbands. 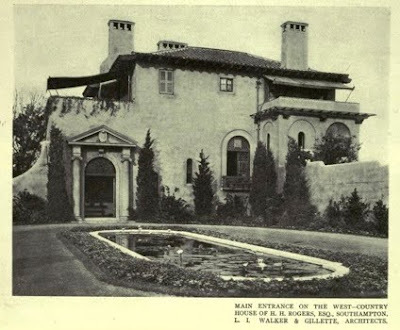 This very beautiful mansion, constructed in 1926 by the architects Alexander Walker and Leon Gillette for the financial figure Charles Mitchell, was occupied by J.P. Morgan & Co in 1939 after the bankruptcy of its owner. Mitchell was a victim of the 1929 stock market crash. Exquisite. Reminds me a little of some of David Adler's villas. "Ancient," I look forward to reading your account of your dinner. 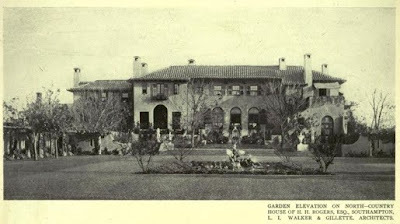 A new biography of Rogers' granddaughter, Millicent, states that the Black Point property consisted of over 1,800 acres. I looked on the Google connection under Black Rock and the perimeter of the estate doesn't enclose even a small portion of 1,800 acres. The next man to build on the estate after the hurricane of '38 passed the property on to his many sons and daughters who built their homes as far away as Water Mill and they were still on their father's estate. They in turn passed the compound on and on and on. Many of this man's 200 some odd descendants still live there.